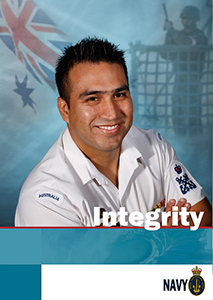 The Navy Values define what is important to Navy as a whole and to its people individually. Our Values guide our behaviour, they bind us together, are a source of strength, and a source of moral courage to take action. 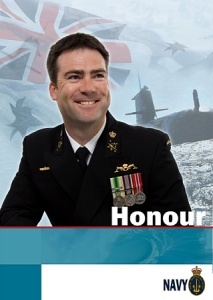 Honour is the fundamental value on which the Navy's and each person's reputation depends. To demonstrate honour demands honesty, courage, integrity and loyalty and to consistently behave in a way that is becoming and worthwhile. 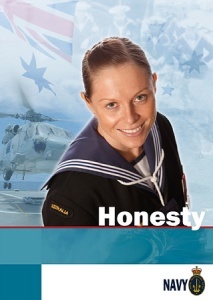 Honesty is always being truthful, knowing and doing what is right for the Navy and ourselves. 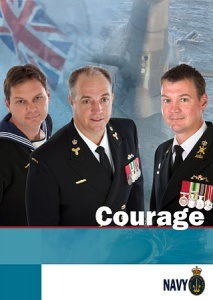 Courage is the strength of character to do what is right in the face of personal adversity, danger or threat. Integrity is the display of truth, honesty and fairness that gains respect and trust from others. 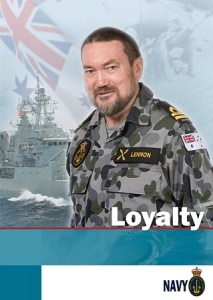 Loyalty is being committed to each other and to our duty of service to Australia.